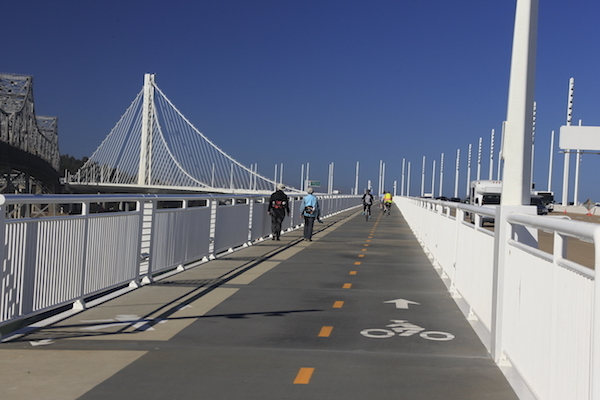 This is one of the great new running options in the Bay area. It’s not possible to run all the way from San Francisco to Oakland on the Bay Bridge, but there is a wonderful 4-mile path from Emeryville to Yerba Buena Island in San Francisco. The last section of this was completed in October 2016. The wide path has separate lanes for pedestrians and bicyclists. The views are fantastic. A highlight is the East Span’s signature 525-foot tower. There are three access points: from the Ikea store in Emeryville, from 210 Burma Rd. in Oakland, and Vista Point on Yerba Buena Island. This map has additional information on the trail. Add-Ons: Run around Yerba Buena Island and Buena Island (3+ miles). On the mainland, good connections to the Bay Trail. Nicest part is heading south from Emeryville, toward Marina Park.